France and the United Kingdom are among the most popular countries for motorcycling, particularly in urban areas where public transport can be expensive and not always reliable. Whilst motorbikes and scooters represent a cheaper, greener and faster mode of transport, riders must remain highly visible at all times to maximise their safety on the road. Most car drivers on the road are not used to or don’t think of watching for a motorcyclist in traffic. Attending bike safety courses and increasing motorcycle inspection standards can do very little to change the way motorcyclists are perceived on the road. The best way to stay as safe as possible is to make sure that other drivers can see you. Staying highly visible keeps you from blending into the background in a traffic situation where cars far outnumber bikes. 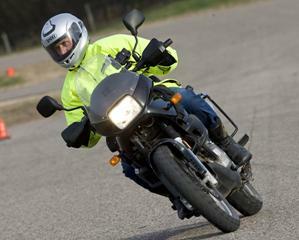 A few simple changes to your riding can increase your visibility and keep you safer. The most visible part of your motorcycle in car traffic is you. Try to wear brightly coloured jackets that are easy to see in any weather. Many motorcycle jacket manufacturers today use bright reflective materials to make riders more visible. Adding reflectors to your bike will also help you catch the light and catch the eyes of other drivers on the road. A brightly coloured helmet is also a good way to remain visible. White helmets provide the best reflection, even on a cloudy day. The way you ride can help you stay more visible. Avoid keeping a straight trajectory as you drive down the road. Safely moving from side to side in your lane, or switching lanes regularly, will help other motorists see you. Position yourself in the lane so that you can see the side mirrors of the car in front of you. When you approach an intersection, stay closer to the middle of the street so that any cars that are turning can see you clearly as early as possible from their side of the intersection. Avoid driving too close to the car in front of you so that you can stay out of the blind spots to the right and left rear of the car. Your lights are excellent tools when you want to remain highly visible. Always drive with your headlight on. Drivers will notice the light in their mirrors when you pull in behind them in traffic. An inexpensive headlight modulator will make your front light pulse slightly, which will catch someone’s eye much more quickly than a steadily burning light. Flash your tail light a few times before you begin to slow down. This gives the driver behind you more time to realise you are there and adjust to your new speed. Remember to use your hands to indicate your intentions to other drivers. A motorcycle rider who is always leaning into the handlebars and never moves can disappear into the background. Use hand signals when you plan to change lanes or make a turn. Your sudden arm movement will usually catch someone’s eye so that they are more aware of you and your bike. 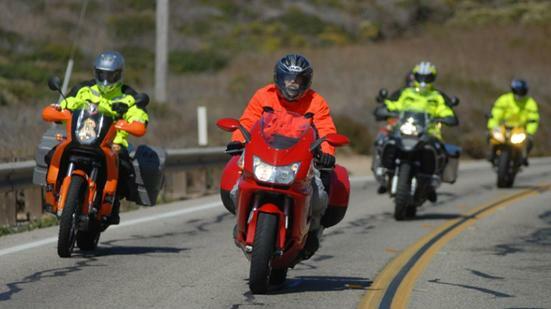 Inexperienced riders should practice using hand signals before they try it in traffic. Now, why not watch the short video below which will show you all the tips you need to stay safe by staying visible on the road. This post has been written by one of our readers, Jessica Bosari, who writes for carinsurancequotescomparison.com, a site that seeks to help consumers stay informed about important insurance issues and compare motor vehicle insurance to get the best rates. It is not MY responsibility to make myself visible to other road-users! It is THEIR responsibility to OPEN THEIR EYES!! If we follow this way of thinking to its logical conclusion; every motorcycle accident will be blamed on the rider for not making him/her self more visible. Car drivers will be absolved from all blame as they will be able to use the defence that the motorcyclist was not visible enough. I have to disagree with you Morph. It is not the responsibility of car drivers to make yourself visible, it is yours. If you’re not visible enough to them, even if they open their eyes as you say, they won’t see you and will make you fall off your bike. It’s only by staying visible that you will minimise your risk of being hit by a car. I’m a motorcyclist and my philosophy is to protect my life by doing little things that will save me. I don’t care whether it is my or their responsibility for accidents, the fact is that I don’t want to die too soon because I have not done my bit. Morph, it doesn’t matter if you are in the right. As the more vulnerable you will be hurt badly by any little mishap. Riding a motorcycle is a high risk activity. You have to accept a specific level of risk and live up to that. Some riders are going to wear bright colored protective gear, some are going to wear dark but protective leather and some will wear no protective gear at all. You have no control over the other people on the road or the environment… all you can do is control your decisions. That means it is up to you to get training, practice, wear the right gear and ride a motorcycle in good working order. Or you could just believe in fate and forget all this good advice as nothing is in your control. Staying Highly Visible……..Nice concept , called conspicuity and something that has been banded about since before the 1970,s and yet we are still not seen. Ask any police bike rider on a big multy coloured visible bike and wearing Hi Vis and Day glo and he/ she will tell you that they still have to avoid other vehicles pulling out on them or doing other silly things. In a recent publication it was mooted that to be multy coloured may not be a good thing as it may indeed add to the camaflage effect making one blend in more to the background. Example is a green/yellow bike in front of a similarly coloured Ambulance or side on to it whilst a black bike with a black rider would easily stand out from it. Maybe a green bike with grass or green bushes behind wont be seen. A white one or black one would. It all depends on the background and we have no control over that. Daygflo itself is great under bright, good or fair lighting conditions but wont be as visible if old and worn or dirty or in dawn, dusk or night time conditions or inclement darkening weather. More so in urban areas where there is a wet road surface and all the lights are on. the biker just becomes absorbed in a cresendo of lights and therefore may as well be invisibe. Also remember that stripes that glow need a light source within a small accute angle, pointed at them, so a car driver looking right or left at a T junction will not see anything reflected by a motorcyclist untill that biker is under his bonnet. On the other hand if one doesnt wear such clothing then in the future the way things are going any biker involved in an accident will have his claim reduced by up to 50% if he isnt making himself visible. You have been warned. What to wear……. Just remember the above and also that it doesnt matter if the driver looks directly at you or you are turning loop de loops never every presume that you have been seen and ride defensively at all times. How to Ride…..Best keep away from anything in front that would hide you from oncoming traffic or other traffic wishing to turn into you road or path. Simple as that. Do not ride close to the kerb as that would encourage you to be overtaken or not seen by the driver behind. Also the driver behind will concentrate more on the vehicle or road in front and not have his eyes on you. Riding close to the centre of your lane means that you will generally be in front of a car driver and thus more visible to him and more of an obstruction. Dont bother about seeing the driver of the vehicle in front through his offside mirror it just means, ifbeing in the centre lane, pull back so that you can see the mirror and then you will probably be far enough away to be seen by other road users. If in doubt move further back and use the 2 second rule. even in towns unless its really busy with stop start. Light modulators are not allowed but if so may be misconstrude as a come on and thats dangerous. Flashing the back brake is a good idea but some riders dont use the brakes and slow using de acceleration and gears so the vehicle behind wont know that they are slowing ahead.